Catchy Air Kendama Review Kendama Trick In this video we are going to be doing a review of the Catchy Air kendama, which is made by Catchy Kendamas. Right off the bat you will notice that is a plastic and rubber hybrid Kendama and it is actually the worlds first plastic rubber hybrid which is pretty cool. Because it is plastic we do get a lot of questions asking, “can it do all of the tricks?” Yes it can do all of the tricks. You will notice that the rubber rings are in each cup which allows for more grip you’ll see that there is actually a slight raise on the rubber rings that allow the tama to contact the rubber and not the plastic. Which not only allows a lot of grip but it also prevents the loud slinking noise from plastic hitting plastic which is really nice. 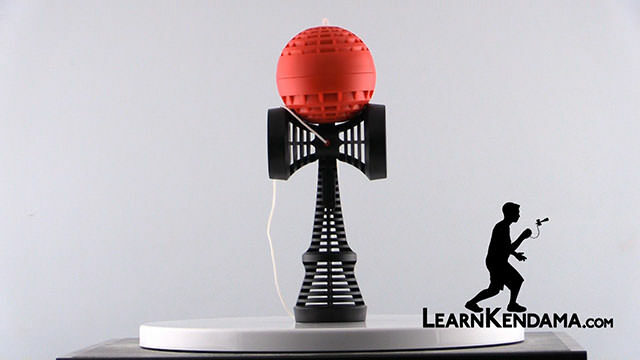 You will also notice that the base cup is slightly larger than the standard kendama and that allows you to do the popular Lighthouse trick a lot easier and it also makes learning some basic tricks a little bit easier as well. Moving up the kendama you will see that the tip, because it is plastic it is not going to dull or break. Which is really nice because a lot of wooden kendamas after some heavy wear and tear will actually dull down making it really hard to even spike the kendama. Since this will stay almost brand new the whole time you play with it, it allows you to constantly spike and impress all of your friends. Because it is plastic you also will notice that you can play with it outside in the sand, in the water, which has been really nice because our kendamas haven’t been getting dirty or breaking at all. You will notice also with the ken that the rings may sometimes come out, even though they do have an adhesive sealant underneath them after some wear and tear, they can pop out and to solve that you just need to use a little bit of superglue underneath and you will solve that problem pretty easily. You will also notice on the sarado that there is a small plastic piece that is connecting the two. This is really nice because it allows to change the string really easily without having to manage the two different pieces and even take out the red and you can slide the sarado off this way which makes it really really cool because if you have more than one you can swap out the colors. You also need to take this red piece in this case and put it on the other side if you are left handed. Because you will notice on this piece that there is a slight ridge right here and you want to make sure that the end of the string is touching that. 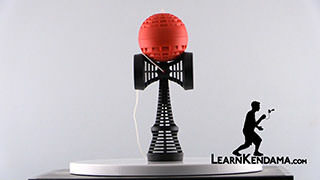 That way when you are doing your tricks and the string is pulling against it, this ridge stops the piece from sliding out, so if you do switch it to left handed without swapping this you will find the problem of the red piece sliding out of the kendama and your tama will fly off and no one wants that. Moving on to the tama, we have gotten a couple of emails because this is two pieces some people will take their kendamas over concrete or asphalt and slam it into the ground as hard as they can and sometimes that causes the tama to split apart a little bit or you can completely. You can put them back together really easily and if you do do it a lot sometimes you may not be able to snap it back together. So all you need to do is get a little bit of superglue right where the tama meets and that should solve that problem easily. So that is the review on the Catchy Air and now we are going to show you some of the benefits of this through tricks and also what tricks might be a little bit more difficult on this kendama. As we mentioned earlier in the video we get a lot of questions asking how the Catchy Air Performs. The first thing to take note of is that both pieces are perfectly weighted which makes tricks like Swirl, Space Walk, and hand roll a lot easier to perform which is also a really awesome thing. You will also notice that there are rubberized grips on each of the cups, making it really easy to catch the different cups if you are just learning. It also has a bigger base cup making it easier to catch the base if you are going to do some cool base cup tricks like that and also makes advanced tricks like Lighthouse a lot easier as well since it does provide a lot of grip due due to the rubber and the bigger base cup. 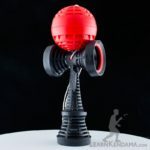 So you would think it out be off balance due to the bigger base cup but it is actually designed to be a really well balanced kendama so even tricks like lunar are pretty easy with both the design of the ken and the rubberized grips. One thing to note is tricks such as Bird and Stilt where your balancing the kendama with the plastic are really difficult on this kendama unless you are extremely experienced in this specific trick that you want to try. Because it is plastic on plastic it is pretty slippery but with a little bit of practice and once you start feeling you are mastering that trick, the tricks can be performed. But all in all at such a low cost this kendama is a great piece to add to any collection of kendamas you already have since it is such a fun and unique experience with the kendama and it is also a great kendama to pick up if it is your first kendama because it has so many great benefits to it, allowing you to progress through he beginning tricks faster than a lot of normal kendamas. So that is the Catchy Air kendama.